Don't laugh. I have a confession. It was my first time to watch a Star Wars movie last night. I know the musical scoring, and the signature texts appearing in the screen as if we were lost in the galaxy reading the lines. Those memories were a blur and reminiscent of my childhood days. But I have never really embraced the Star Wars phenomenon when the episodes 1, 2 and 3 were released. So I got to watch the Episode 1 last night. But I did it with style. I watched it in 3D! 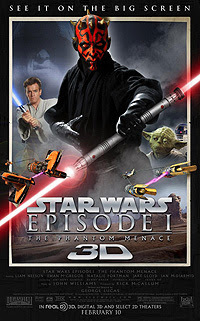 Yup, I watched Star Wars Episode 1 (The Phantom Menace) in 3D! For the record, I know Star Wars. I know Luke Skywalker, I know Yoda, R2D2 and the other characters. I basically know the story - but not all the details and action scenes. So I was delighted to finally see the movie (and be one of the firsts to see it in 3D!). The force is with me. I am no expert in movie reviews, but let me just share my honest thoughts and review. There is no level of comparison for me. I were like a virgin, or a moviegoer from the primitive years experiencing the movie for the first time. I asked my friends' opinion if there were added scenes, and all the exciting elements of the original remain, with added dimension and nuance. I personally love the racing part. 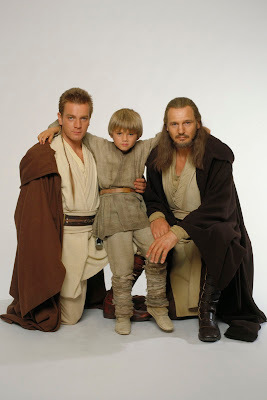 (That Anakin boy (Jake Lloyd) is really cute! I love him and I want to take him home!) I was just waiting for my seat to move and for those rocks to smack straight in my face. I know converting an epic movie which was previously released into a 3D movie is real hard work. Although it cannot measure to the new films which are originally created in 3D, the whole experience is just great especially that there were Jedis and R2D2 greeting you at the entrance of the cinema. Including R2D2. At the end of the movie, I want to scream, I want more!! To be honest, there isn't much of that experience where you will feel that rocks, debris, dust and water are coming your way (probably because there is no need for such effect based on the story line). But I like the idea that the movie didn't give me eye strain. We went to the washroom at the middle of the movie (thanks to my overactive bladder and apologies other movie goers), and I was still able to walk and adjust my eye sight. I think that is the best part about the movie, and that is what I am looking for when watching in 3D. There is no need to put everything in 3D perspective if there honestly no need to do such. Why pay for something that would give you headache and eye strain? The movie is really an experience for kids. I hear some kids screaming during some scenes. And my friend too (a twenty something adult!). Go watch the movie and feel the experience. Here's more info about the Star Wars Episode 1 in 3D. The epic adventure “Star Wars Episode 1 The Phantom Menace,” from visionary filmmaker George Lucas, captivated global audiences when it first came out in 1999. In between the production of Episode II (2002) and Episode III (2005), director George Lucas first began exploring the idea of presenting the entire Star Wars saga as 3D theatrical releases. 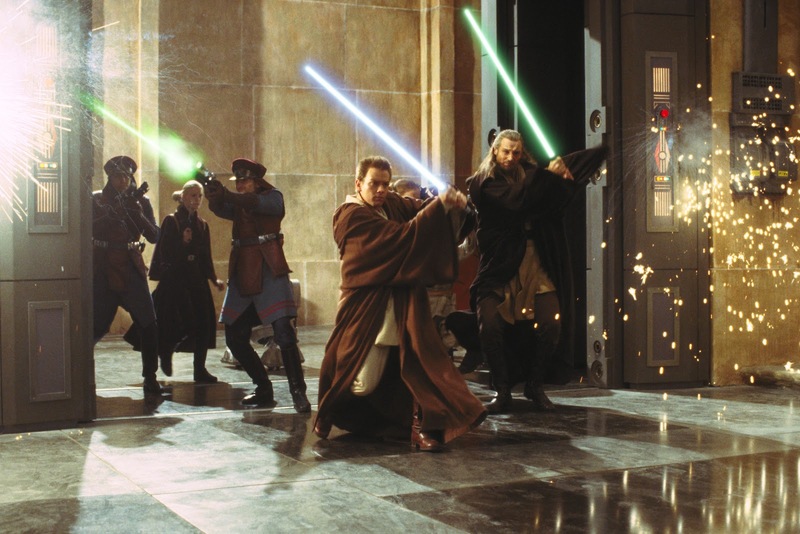 Active 3D conversion work on “Star Wars: Episode I The Phantom Menace” began in 2010. ““I'm really excited about the new big screen release of the film. We’ve worked very hard to get the best quality 3D we could. The big screen experience is so much better than watching it on television. It was designed to put you in the environment and surround you with the sound and the picture. There is nothing like it. I'm so glad that we were able to bring this whole experience to the next generation. This will be the third generation that will be able to see it on the big screen and when you're young, it’s an overwhelming and powerful event,” relates Lucas on the 3D conversion of the movie. Lucas recalls that “Star Wars: Episode I The Phantom Menace” underwent a painstaking frame-by-frame conversion from a 2D film to a 3D experience thanks to the efforts of Prime Focus, a global visual entertainment services company, and Industrial Light & Magic (ILM), the preeminent visual effects company that has produced the visuals for all the Star Wars movies. “Originally I was not a big fan of 3D. I really thought 3D was a gimmick. Then later on I was trying to get digital projectors into the theaters. I was doing a presentation in Las Vegas. Bob Zemeckis and Jim Cameron came up to me and said: ‘We want to get 3D into the theaters. Would you join us in showing the theater owners that you can do 3D?’ And I said: ‘That’d be good because in order to do 3D you have to have digital theaters. So it would promote my idea of digital theaters.’ Then when I saw the test that we did of Star Wars in 3D, I realized how great it was and how great it looked. I became fascinated with the idea of converting STAR WARS into 3D, which was easier said than done. It took us a long time to develop a structure in which we could actually do a really good conversion of a 2D film into a 3D film,” further shares Lucas. 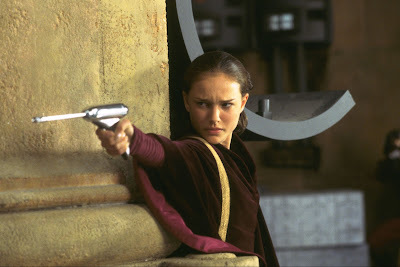 “Star Wars Episode 1 The Phantom Menace” (3D) opens February 9 in cinemas from 20th Century Fox to be distributed by Warner Bros.